Includes the most-needed tips for working on R/C drones, park flyers and vehicles as well as watches, jewelry eyeglasses and more. 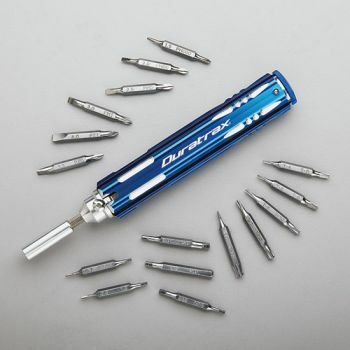 Anodized aluminum handle holds 15 short-shank double-tip bits, another bit stores in the in-use position. Nine tip options for Torx (or "star") screw heads. 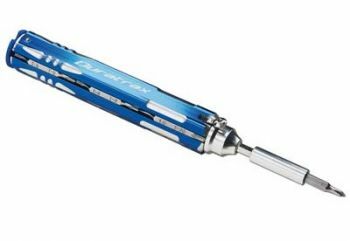 Bit shanks lock onto the adjustable-length shaft with a push for easy attachment and release. Sizes clearly marked on each bit. Flattened handle design prevents rolling off of workbench. Double-tip bits have two tips with the sizes indicated. PH000 / 1.5 mm slotted. PH00 / 2.0 mm slotted. PH0 / 2.5 mm slotted. PH1 / 3.0 mm slotted. PZ0 / 3.5 mm slotted. PZ1 / 4.0 mm slotted. .050” hex / 0.7 mm hex. 0.9 mm hex / 1.5 mm hex. 2.0 mm hex / 3.0 mm hex. 2.5 mm hex / 4.0 mm hex. 3/32” hex / 1/16" hex. 1.0 mm slotted / T-20 Torx.